When it comes to vision correction, it’s likely that you’ve heard of LASIK. Vision correction procedures have improved and changed immensely over the years, and new options for vision correction are regularly being developed and tested around the world. Now, almost anyone can find a procedure that will allow them to reduce their dependence on glasses or contacts, even if they are not a candidate for LASIK eye surgery. Now, there’s a new procedure called SMILE on the market, which became FDA approved in 2016. Dr. Hamilton at the Santa Monica Eye Medical Group offers the SMILE Eye Surgery to patients throughout the Los Angeles areas. Will SMILE give LASIK a run for its money? Keep reading to learn more about the SMILE eye procedure that is now available in the Los Angeles area! SMILE was first developed in Germany over 10 years ago. To date, SMILE has been performed over 1.5 million times all over the world. Dr. Rex Hamilton was the first surgeon to ever perform SMILE on the West Coast, bringing the ground breaking procedure to the greater Los Angeles areas. The acronym “SMILE” stands for Small Incision Lenticule Extraction. 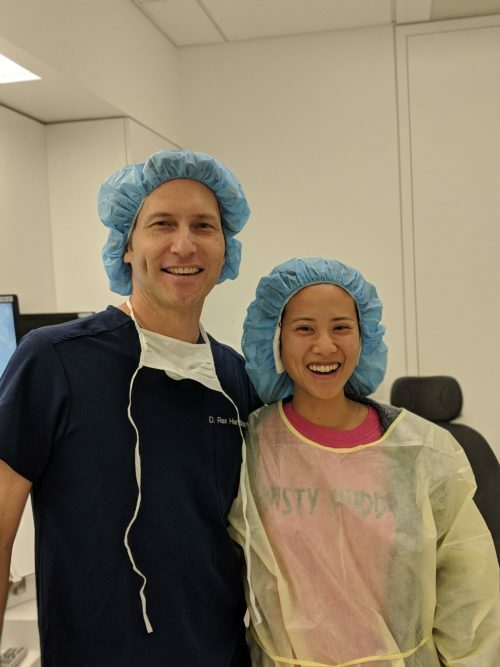 The SMILE Eye Surgery procedure has been approved by the U.S. Food and Drug Administration for treatment of spherical myopia (nearsightedness) and more recently for myopic patients with astigmatism. More than 600,000 procedures have been performed in more than 60 countries throughout Europe, Asia, Russia, and South America. SMILE eye surgery uses a smaller incision than traditional laser vision correction, resulting in minimal disruption to the surface of the eye. Patients may experience less dry eye as compared to LASIK eye surgery. The SMILE procedure takes ten minutes or less. In some cases, SMILE can be used to correct higher levels of nearsightedness as compared to LASIK Eye surgery. Quick recovery: patients are allowed to wear makeup, exercise, and drive the day following the SMILE procedure. Though SMILE has some similarities to LASIK, they are still two different procedures and require different surgical techniques. LASIK surgery makes use of 2 lasers. Dr. hamilton uses the VisuMax femtosecond laser to create the LASIK flap and an excimer laser reshape the cornea. During SMILE eye surgery, Dr. Hamilton uses the VisuMax femtosecond laser to create a contact lens shaped piece of material known as a lenticule within the cornea. The laser uses tiny laser pulses, applied at an astounding 500,000 pulses per second, to define a lens shaped piece of material (called a “lenticule”) in the center of the cornea (window on the front of the eye). These pulses form bubbles less than 1/100th the width of a human hair. The shape of the lenticule is precisely determined and customized to the patient’s nearsighted correction. The laser then creates a tiny connecting tunnel through which the surgeon removes the lenticule from the cornea. By removing the lenticule, the shape of the cornea changes and corrects the nearsightedness. No flap is required with SMILE and the procedure is completed using only the VisuMax laser. As a result, there is minimal disruption to the surface of the eye and the healing time is very short. Because of the smaller size of the incision, patients experience less dryness after SMILE. The incision is smaller than the flap that’s created when performing LASIK. The small incision additionally allows some extremely nearsighted patients to qualify for SMILE. Because of the severity of their nearsightedness, they may not have qualified previously for LASIK. What About SMILE Eye Surgery for Astigmatism? SMILE was approved in the United States in October of 2018 for treating myopia (nearsightedness) with astigmatism. 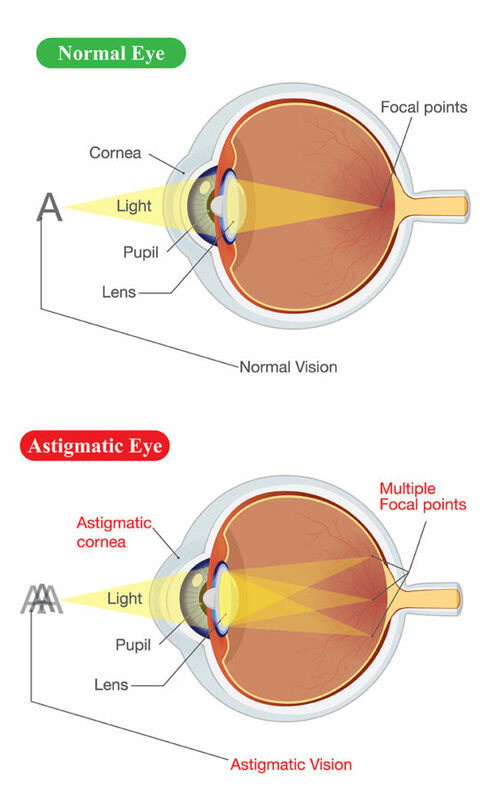 Astigmatism is a common eye condition that can both cause near and distant objects to appear blurred, occurring as a result of a misshapen cornea. While a ‘normal’ cornea is spherical (has the same curvature all over), a cornea with astigmatism is steeper in some areas and flatter in other areas, resembling a football in shape rather than a basketball (spherical). This football shape distorts vision and creates refractive errors. People with astigmatism have blurred vision if it is left uncorrected. This is due to light refracting at many points, instead of one. The SMILE procedure has been used around the world for many years to treat myopic (nearsighted) patients with astigmatism. Fortunately, the FDA has recently reviewed an extensive study conducted in the United States and approved the SMILE procedure for use in nearsighted patients with astigmatism! The safety, efficacy, and excellent visual outcomes proven in the trials made FDA approval a clear decision for the FDA when evaluating the research. In addition to the ability to treat astigmatism with SMILE, the new approval also makes parameters within the femtosecond laser available that allow for a smaller incision and faster visual recovery than was attainable with the initial version of SMILE laser surgery! LASIK is well-known in the vision correction community, and it’s an amazing procedure for many patients. A common side effect of LASIK, however, is the post-operative dry eye that can occur. In general, this lasts for about 6 to 12 months. Symptoms of dryness can be quite bothersome, particularly in patients who spend lots of time looking at screens for a profession or during their leisure time. Because of the larger incision required for LASIK, many of the nerves that sense dryness are affected by the procedure and need to regenerate. During SMILE, a significantly smaller incision is used and only a small fraction of the nerves are affected. The result: patients who get SMILE experience fewer dry eye symptoms for a shorter time as compared to LASIK. Los Angeles SMILE patients can expect a shorter recovery time from the procedure, and are less likely to develop dry eye symptoms. What does this mean for SMILE patients in Los Angeles where the environment is so dry? Los Angeles SMILE patients can expect a shorter recovery time from the procedure, and less chances of developing dry eye symptoms. Corneal thickness is one of the most important factors considered for LASIK candidacy. Patients with corneas that are thin may not be candidates for LASIK eye surgery. Before SMILE Eye Surgery, these patients would have to resort to PRK. PRK is another successful vision correction procedure requiring removal of the epithelium (“skin cells”) of the cornea. The cornea is then reshaped using an excimer laser. During PRK, a contact lens is placed inside of the eye and acts as a bandage while the surface of the cornea heals. As the cornea is recovering, eyes are more sensitive to light, vision tends to fluctuate, and sometimes experience temporary eye irritation. These side effects are temporary and stabilize after a month of recovery. Am I a good candidate for SMILE vision correction? While SMILE is able to provide safe, gentle vision correction for many, not everyone is going to be a good candidate for SMILE. Like LASIK, you must qualify as a candidate for the procedure. Currently, SMILE has been FDA approved for myopia with astigmatism. SMILE is capable of correcting nearsightedness up to -10.00 diopters, and -3.00 diopters of astigmatism. If your nearsightedness and/or astigmatism is outside these ranges, or if you are farsighted, Dr. Hamilton may recommend an alternative procedure for you. Following a comprehensive diagnostic examination, Dr. Hamilton will determine which of the four amazing refractive surgery procedures at the Santa Monica Eye Medical Group is best for your particular situation, lifestyle, and visual needs. What Is Recovery After SMILE Like? SMILE patients often report 80% better vision only hours after the procedure. Most patients experience 100% visual improvement after a week or two! Following the SMILE procedure, patients can expect a fast recovery time. SMILE patients can often resume activities like swimming and contact sports after one week of recovery! While recovering from a procedure like SMILE, the best thing you can do is rest your eyes and avoid straining them. This means you should take a break from screens like televisions or tablets, at least for a few days. Dr. Rex Hamilton will prescribe medication and eye drops to help aid recovery. For the best results with SMILE or any of the procedures offered at the Santa Monica Eye Medical Group, it is important to follow the instructions given carefully. Tired of glasses and contacts and ready to see a whole new world? Schedule your SMILE consultation with Dr. Rex Hamilton and his colleagues in Los Angeles, CA today!